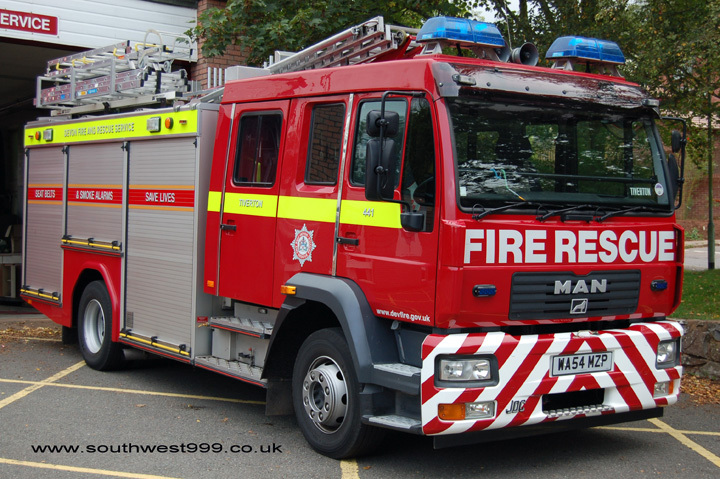 This MAN Watertender/Ladder from Tiverton Fire Station is built in 2004 by JDC. fantastic looking appliance. its a shame that the red and orange banner on the lockers have been substituted for a yellow one on all new pumps entering service since the merger between Devon & Somerset. but at least they havent adopted the battenburg livery - that would look rubbish on this pump. It might be a good idea for all UK fire services to think about adopting the same color schemes, stripes and so forth for all their emergency vehicles. This might well be a lot safer, so that other drivers - who do after all often travel between jurisdictions - would know instantly what was what. It used to be that fire engine red without any weird stripes or checks was the only color - with a handful of exceptions - and in some places, including France, Japan, the Benelux and Poland, it still is! Added by Rob Johnson on 22 February 2018. Personally I think it is really sad how UK fire brigades are losing their identities, visibly so, by losing their own unique livery. Sadly many now sport the dreary battenburg markings. Slowly West Sussex is losing theirs, Lancashire have done away with theirs, Shropshire will be next. The list is too long and depressing to elaborate upon. An England Fire & Rescue Service? Perish the thought! Added by Yelp Bullhorn on 23 February 2018.